We constructed a 4D atlas of the developing fetal brain, between 23 and 37 weeks gestational age at time of scan, using T2 weighted MR images from 80 fetuses. The method used for the creation of the average 4D atlas utilizes non-rigid registration between all pairs of images to eliminate bias in the atlas toward any of the original images. In addition, kernel regression is used to produce age-dependent anatomical templates. A novelty in our approach is the use of a time-varying kernel width, to overcome the variations in the distribution of subjects at different ages. This leads to an atlas that retains a consistent level of detail at every time-point. The resulting 4D atlas has a great level of anatomic definition; an important factor in improving registrations between the atlas and individual subjects. Also, the resulting 4D atlas can serve as a good representative of the population of interest as it reflects both global and local changes. Note that the compressed file includes T2 templates and tissue probability maps (brain mask, cortex, hemispheres, csf and ventricles) for ages between 23-37 weeks of gestation. 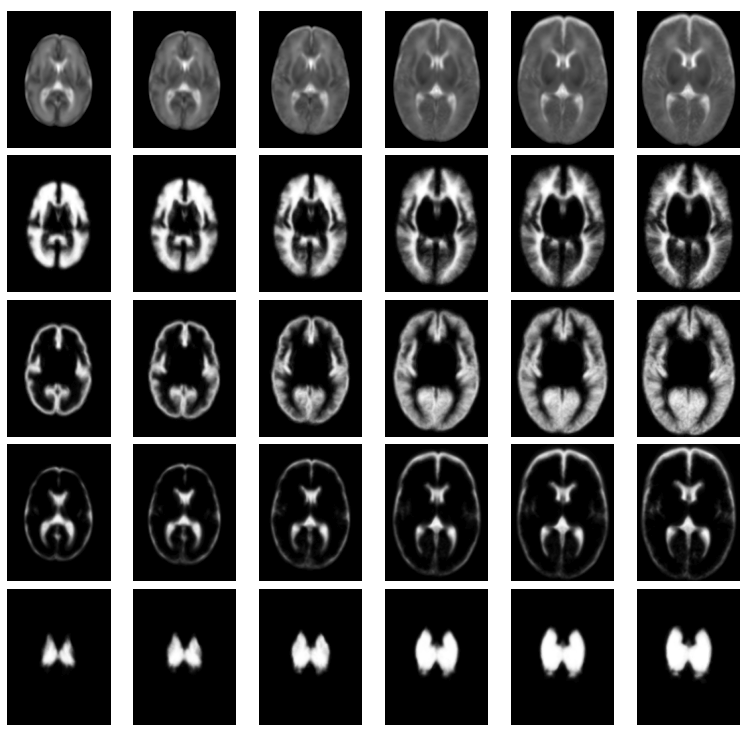 T2 weighted MR images from 80 fetuses with normal brain appearances were used in the study. The age range at the time of scan was 21.7 to 38.7 weeks gestational age (GA), with mean and standard deviation of 29.6 ± 4.6 weeks. The images were acquired on 1.5T Philips Achieva system with the following parameters: T2 weighted single shot Fast Spin Echo (ssFSE) TR = 15000 ms, TE = 160 ms, flip angle = 90◦ and voxel size = 1.25 x 1.25 x 2.5 mm. For each subject multiple stacks of im- ages (typically a total of 8) were acquired in approximately transverse, sagittal and coronal planes and the data reconstructed into a single 3D brain volume using the slice-to-volume reconstruction method described in [Jiang et al., 2007]. The reconstruction voxel size is 1.18 x 1.18 x 1.18 mm. A. Serag, V. Kyriakopoulou, P. Aljabar, S.J. Counsell, J.P. Boardman, M.A. Rutherford, A.D. Edwards, J.V. Hajnal, D. Rueckert. “A Multi-channel 4D Probabilistic Atlas of the Developing Brain: Application to Fetuses and Neonates”. Special Issue of the Annals of the British Machine Vision Association, 2012.